Has God ever taken your plan and said no when yes was hoped for or yes when no was expected? After planning this Holiday Wellness Plan post, God showed me a new plan. Maybe you saw my devotion published by Proverbs 31 Ministries this week. In it, I shared how I began listening more intently to God during a difficult season of my life. The lessons I learned then I’m still learning today. That devotion was all God. The opportunity came not only from me but others listening to God. The writing, while emotional, came by listening to God. I gained so much perspective looking back at how God moved in my life and then writing about it. Being published this week, the anniversary week of Mom’s passing and amid new family losses was no accident either. Then, I read comments on how the words God gave me to write helped others and again was amazed at His plan. Originally, I had another word planned for the L in our HOLIDAY acronym this week. But God had a different plan and clearly the word for this week is listen. L is for Listen. We all make holiday plans. We plan parties, menus, gifts, cookies, crafts, travel, concerts-the list is endless. You name it; we plan it for the holidays. But where in all of this is the true meaning-the ‘reason for the season’? Often it gets lost amid the glitter, gold and gifts. In order to truly Give Thanks and honor our Redeemer’s Birth this holiday season, we must first listen TO Him. God speaks to us daily and in each season; we just need to listen. Listen to what He’s saying in the Bible, our lives, our body, mind and what He’s speaking to our heart and soul. When we sense God speaking, even if it flies against what we want, we need to listen. When seasons of life change and what we’ve always done isn’t possible or healthy, we need to listen. When bad habits keep recycling, we need to listen. When loved ones point out our stress or we feel it ourselves, we need to listen. And when we don’t have enough time to do, be or say what matters most, we need to listen. But how? Listening to God may involve stepping out of our comfort zone. It may mean letting go of something we want to hold close, or grabbing onto something new and unknown. [tweetthis]Listening to God may include letting go of the old or grabbing onto the new #HolidayWellnessPlan[/tweetthis]There are many ways to listen to God. Here are a few ways I try to hear His still small voice amid the noise of this world. Open up the Bible and read. Search for what He’s trying to say to just you. God says if we seek Him we will find Him. But we must first seek by reading the Bible. Pray and listen to His reply. God always answers our prayers; we just may not like the answer. Sometimes it’s yes or no but sometimes it’s wait. I think wait is the hardest answer. It’s living in limbo. We know He has a good plan for us we just don’t know when or how or maybe even what yet. That’s when faith comes in. Walk in the faith He gives. We rest in the knowledge His plan for us is greater than we can ever come up with. Faith is listening by showing up, reading, worshipping, and praying. Listen to trusted voices-Christian leaders, family or caring friends. I’m most often around kids and older adults both of whom are sometimes more blunt in their assessments and comments. This breathes fresh insight into my sometimes stale thoughts. They can see what I cannot. It’s often helpful and how God speaks to me at times. Listen to our bodies and learn. If we are having aches and pains, gaining or losing weight without trying, can’t sleep, remember or are negative in word or action with others or ourselves, it may be God speaking. Listening to the physical clues He provides can lend valuable insight into habits, triggers or physical issues God is telling us to address. The holiday season is bearing down like an oncoming train. It’s increasingly difficult to hear His still small voice over holiday hoopla. But we need to find time and quiet to hear Him. Seeking, listening and following His voice from small things to those that seem impossible has led me to the most meaningful people, things, experiences and moments in my life. Try it. Be still, know and listen for His voice and His plan for your holidays and beyond. I’m so glad I’m next to you at Thoughtful Thursday, Jill, because I really needed to read your Proverbs 31 devotional. (This one is good too, but the other one spoke directly to my heart and situation.) My heart aches for your loss and what you went through with your mom. The message you heard (“be still, be present”) is one I need to heed, also with my mom. Thank you so much. Hi Lois-I’m so happy that the devotion was helpful to you. It’s a constant battle to shut out the noise of this world to hear His still, small voice but so worth it as we seek to follow. Blessings to you as you follow His footprints, listening to His voice in your life. Much needed words of wisdom. I absolutely need to pray and really LISTEN for direction. Thanks so much! Thanks Brittany, we all need to listen to God’s direction in our lives. Glad to have connected with you! Thanks for comments and blessings as you follow Him! 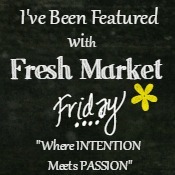 I’m a neighbor at #FreshMarketFriday. I appreciate your post and your admonition to listen to God. It’s easy to get busy and never be still long enough to hear what God is saying to us. I pray that we all slow down and really listen. Your suggestions are timely. Thanks Gayl and we all get so busy and focused on ourselves at times we miss the nuances of hearing His voice in our lives. Thanks for your comments and blessings to you as well as you seek Him! Jill, I love how God refines our message to be His message, and I am so grateful you wrote from His prompting instead of your plan (Proverbs 19:21). Love this. It’s so easy to ignore that still, small voice, but when I do, I regret it every single time! Thank you for the reminder that listening is so very important. Yes! As He is the Author and Perfector of our faith, His message is what matters most, to us and those we seek to encourage to grow closer to Him! Thanks Teresa for your thoughtful encouragement! Thanks Crystal, it is about stepping out to be able to hear His still small voice speaking in ALL our circumstances. Thanks for stopping by, always a pleasure to see you! I love how you outline here so many ways God could be speaking to us, through His Word, people, and even our own bodies! So good and practical and true. And I was so glad to see you at P31. Blessings and grace to you during this anniversary of your mom’s passing away. Thank you, Betsy! I am constantly humbled by God’s work and how He speaks to me, in good times and in bad. Listening more intently has been such a blessing and comfort. I am happy to share what He has been teaching me as I listen and follow. Thanks for your encouragement, my friend!